Ben Kersen of Victoria, British Columbia, Canada, began training dogs in 1979. In 1999, Ben started his professional dog trainers school. Students come to Ben from all over the world to learn how to become a Certified Dog Trainer. Over the years, Ben and his Wonderdogs have made news all over North America on radio, television, and in news publications. They have also been featured on NBC’s “A Salute to America’s Pets” with Alec Trebek and the “Today Show” with Willard Scott. Ben has helped thousands of dog owners worldwide solve every conceivable dog dilemma through his dog training videos, dog training seminars, and Professional Dog Trainers Program. Ben’s training techniques show you how get fast results and have fun at the same time! Coming up with the concept for a Pet hotel and Daycare radically different from a typical kennel. Over 400 successful graduates from Ben’s Professional Dog Trainers Program over the past decade. Graduates are worldwide from Africa to Europe, Latin America, Indonesia and Japan. Thousands of satisfied clients from Victoria to Los Angeles dating back to 1979 (and the letters of reference to prove it!). Appearances on many prominent television shows such as the Today Show on NBC and Alex Trebeck’s “A Salute to America’s Pets” on ABC. Click here for more. 17 video clips on youtube that have over 50,000 hits. Click here to view them. One of the highest levels of dog training ever achieved in North America. Many of the Wonderdogs’ tricks and responses have never been duplicated . Click here to see a demo. A long history of training dogs for TV and advertising. Click here to see samples. Over 100 radio, TV and newspaper interviews dating back to 1985. Click here to view examples. Ben has produced 10 complete dog training videos to date and 14 audio segments on problem behaviours. Click here to view them. 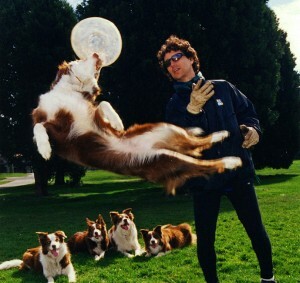 Ben started to develop his unique method of dog training in 1979. The reason it is so different from many training techniques is because Ben did not study under anyone – he developed it entirely on his own based solely on the results he was achieving. The six original Wonderdogs were Fozzie, Shiloh, Shae, Hobie, Swift, Hannah. Shae, Shiloh and Fozzie were Ben’s dogs. Swift and Hobie belonged to Erin Simpson. Hannah belonged to Kay Burley, Erin’s mother. When Kay passed away, Hannah joined Ben’s crew at age10. The original Wonderdogs hail from Merritt, BC and were bred by Sheila Kirk. Their bloodline goes way back to Tracey Brown’s dogs in South Dakota. Ben purchased Shae, his first border collie in 1985. At that time, very few people living in the city had border collies. They were mainly used on farms for livestock and almost no one had a red and white border collie. Ben currently owns Joey and Roo-Roo. Joey is a red and white border collie with half of his bloodline hailing back to the original Wonderdogs. Roo-Roo is a Belgian malinois. Working with a malinois compared to a border collie can be difficult at times, but as always, Ben enjoys a challenge!